I’ve been to some poorly organized shows in my life. Just last year, here in Singapore, the Guns n’ Roses concert was quite the debacle, starting with complicated transportation options: the venue was way out past the airport with only one 2-way street in and out. Then the fans were left to bake in the hot equatorial sun for hours before the concert started. There was a giant air-conditioned warehouse there for the merch tables, but the stage was outside. There was only one merch station. There weren’t enough food or beverage stands, and the organizers insisted on a rip-off, chip-bracelet “cashless system” for purchases. People were fainting from dehydration and heat exhaustion. Sound was bad. The back half of the venue had a view of a giant black screen with nothing on it for much of the show, which blocked the view of the stage. Getting out of there was chaotic. I loved seeing the band and we’re experienced concertgoers so we mostly avoided the bad stuff, but whoo boy I’ll definitely never go to that venue again, and I was even hesitant to see another concert hosted by that promoter. Regarding the Altamont festival, I honestly didn’t know more than “someone was killed at the show” before reading this book. Wow. This entire event, from the planning stages to well afterward, was a disaster. Basically, the Rolling Stones had a wicked case of FOMO and wanted to cash in on the “free festival” trend, after not participating in Monterey Pop or Woodstock. The vibe at the time was that musicians felt that the music was their priority and they were not so interested in money, but that couldn’t be further from the truth (except maybe in the Grateful Dead’s case). The Stones’s career was flailing and they needed money so it decided to do a U.S. tour (despite being out of touch with America’s music scene in the late ’60s), invited a film crew along, and finish the tour with a free concert in California. Everything that could go wrong did—there were shady, major characters involved in the planning, the execution was lazy, and no one anticipated any violence after such a peaceful showing at Woodstock just months earlier. I had no idea how much the Grateful Dead was involved. After playing several successful free park concerts, it was the Dead that suggested to the Stones to end with the free festival-style concert, for which the Dead also signed on to play. The Dead also suggested hiring the Hells Angels as security, after using them multiple times without issue. Pretty much no one in the Stones’s entourage took the time to handle with care or precision each intricate detail of putting on such an epic event. Everyone wanted to do things the easy, free (or at least cheap) way. 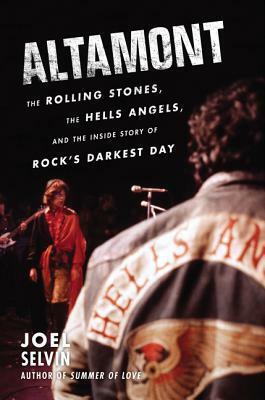 Altamont was located in an area with a faction of Hells Angels unknown to the Dead. Violence was brewing from the beginning, and there was bad acid floating around. The stage was shoddily set up, only four feet off the ground, without proper space or barriers between the band and the 300,000 fans, with only about 40 Hells Angels for security. It seems like everyone was tripping on bad LSD. There weren’t enough medical tents or toilets or food/beverages available. I was dismayed (but not surprised) to learn the Stones stiffed almost everyone along the way and afterward, damages to the land, hotels, car services, etc. Reading this was like watching a car crash in slow motion. I watched Gimme Shelter the day after finishing the book, and while I appreciated that it added images and sound to the words I’d just listened to, it wasn’t a true documentary. Major people involved were left out of the picture, two members of the Grateful Dead were on screen for maybe thirty seconds, the prevalence of dangerous drugs wasn’t shown, and it looked like the Hells Angels were to blame for the violence. It was disturbing to see the Stones keep playing their set (granted they stopped a couple times to try to quell the violence), but especially disquieting to see the look on Mick Jagger’s face as he watched the footage of one fan stabbed mere feet from the stage, and subsequently have pretty much no reaction. His greed is partly the reason for the violence and tragedy at Altamont. Four people died—one by drowning, two by vehicular manslaughter, and one right in front of the stage, Meredith Hunter, stabbed by a Hells Angel. It was interesting and sad to read about a concert where violence broke out like this, after the gun massacres at concerts in the last few years. This is a shocking and upsetting read, just yet another example of the worst in people coming out. But it’s one of the best cultural histories I’ve read—I highly recommend if you’re into the music scene of the 1960s. This entry was posted in books and tagged american history, audiobook, history, music, music history, non-fiction, pop culture, true crime by kristin @ my little heart melodies. Bookmark the permalink. I really enjoy well researched narrative nonfiction, but I’m not sure about this one. It sounds frustrating to read about everything that had to go wrong to lead to such a tragic outcome!